About one year ago, my family and I said farewell to an old friend of ours. Our cat, Jake, who had been with us for fifteen years, died of old age as her heart failed. I posted the blog post on Oct. 24, 2011, and the one-year anniversary of that post is in just two days. This post is meant to be an homage to Jake's fond memory through new, happy news. It seems that, for me and my family, things have truly come full circle. Just under a month ago, my Dad came home to find a pair of sister mother cats and their respective litters of kittens--6 in total--hiding under the cabin in the lower lot. For a man who loves cats as much as my father, this was a pleasant surprise. For about a week, he took good care of those cats and kittens. He fed them and cleaned up after them, gave them a roof over their heads and gave them all the love and attention they could ask for. I went down to visit and was getting ready to decide which kitten would come home with me. 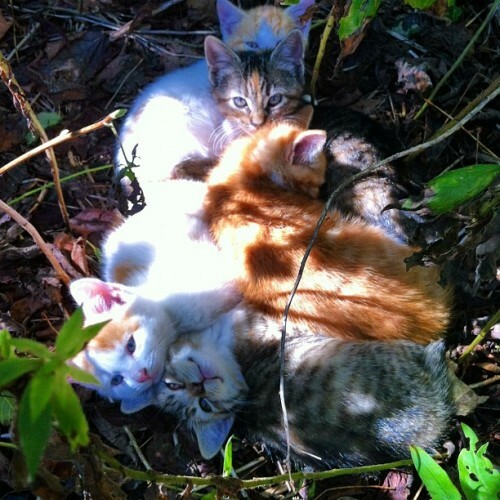 The decision was impossible--six sweet kittens, and all of them with their own lovable traits. Absolutely impossible. Just under a week later, the cats vanished without a trace. We were all devastated and concerned. Maybe something got to the kittens, or the mothers moved them somewhere else. I hadn't decided which kitten to give a home to, but I was excited about the prospect of another cat in the house. Regardless of this, the safety of the cats and kittens was our foremost concern. My parents searched for a few weeks, but to no avail. As time stretched on, we began to lose hope that we would see them again. Nonetheless, my parents kept up the search. One day, without warning, the mother cats came back, alone. Dad caught wind of people adopting the kittens, which made me happy but a bit sad. I was happy they got homes, but obviously, sad that I couldn't be the person to give them one. Dad started feeding the cats and they hung around outside the house, giving the place a new life it hadn't seen since Jake died. The night the mother cats returned, I had a dream. I dreamt that the cats appeared at my parents' house, with one of the kittens in tow, and that I took that kitten home with me. 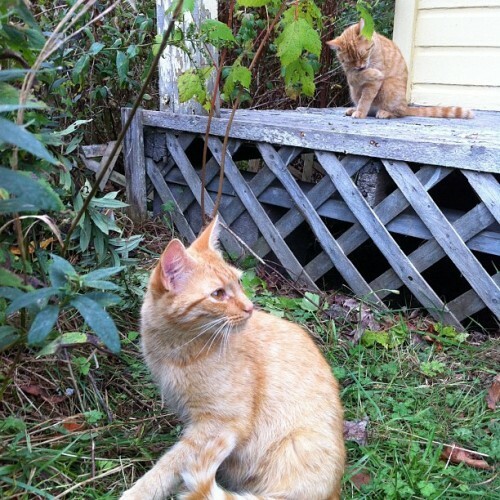 That kitten was orange and white, like four of the six kittens in the litter were. It wasn't a strange dream to have, to be honest; I was already thinking about the cats so of course I dreamed of them. I woke up and told Dad about my dream, then, to my surprise, discovered that he had the exact same dream. That night, my phone rang. I answered, and my Dad, on the other end, frantically relayed a message that the cats appeared as Mom was on her way up to town... with two kittens in tow. I couldn't believe it! But then, he told me that they had flea collars on, so they obviously belonged to someone. He asked me for advice so I, without being able to hide my disappointment, suggested that he call around. He said that he would and he would get back to me. Not long after, my husband and I were sitting down to have supper when my dad called back. The kittens, it seemed, belonged to the neighbors, and as did the mother cats. It certainly explained why they were over so often! The good news, then, was that they would be visiting, considering they were indoor-outdoor cats and, well, they were just next door. Still, I couldn't help but feel a bit of disappointment as I hung up the phone. The cats had homes, and they were nearby. I should have been happy. I never thought I'd see those cats or kittens again, and they were just next door, and, it seemed, more than happy to migrate back and forth. This should have been excellent news. But, I'm only human, and I'm a bit selfish. I was disappointed to hear that one of those kittens wouldn't be coming to live with me. It seemed like the end of it. Just as we were finishing up supper, my phone rang again. I answered to my mother, quite suddenly, asking if I wanted a kitten. Shocked and stuttering (and, admittedly, after shouting "YES" into the phone), I asked for an explanation. It seemed the neighbors had the two mother cats and three kittens, but really, were giving most of the kittens a home simply because they had the mothers living there. While one of them wanted to keep the little tabby kitten, they told my parents "Kate can have one of the orange ones, if she wants". Rewind back to the dream I had. 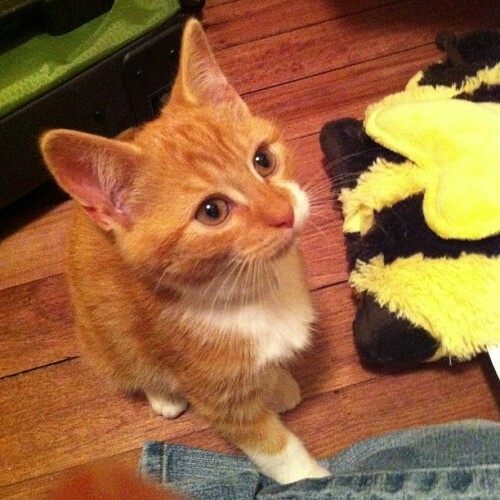 An orange and white kitten. I don't want to necessarily say that there is such a thing as fate, or things happening for a reason, but this seems a bit too much to be a coincidence. All I know is that if you had told me, yesterday morning, that one of those kittens would be living in my house by the end of the day, I would have called you a liar. About an hour and a half after I got off the phone with Mom, I had a very happy reunion with a little guy I named Rusty. 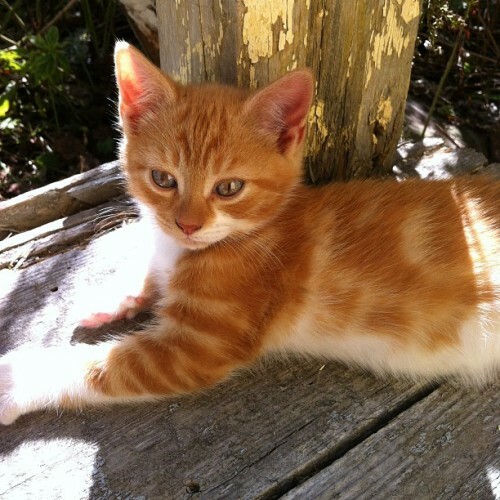 Even his name has a story behind it: he was the kitten with the most vibrant, bright orange red in his fur, and the time I helped Dad out with the cats about a month ago, I also spent naming the kittens individually. It certainly beat "orange kitten", "other orange kitten", "runt tabby" and "the white kitten with an orange tail and a couple orange spots on his back". Dad and I were talking about something I can't really remember while we were standing on the deck, and he pointed to something, saying "that's all rusty". Rusty, I thought to myself. Indeed. And thus, the first kitten was named. Lady Pansy, our four-year old tabby, is (very) slowly starting to warm up to him. I think that, in time, they will grow to be great friends. Rusty, then and now. He was only about eight weeks old when we found them, and here he is now at twelve. Notice his pretty amber eyes! The best part? I didn't even have to decide. The kitten was chosen for me, and I was more than happy to take him. I would have given any of them a home, but the decision-making process was excruciating. And now, I have shared my story about the latest addition to our family! Thank you for reading. A little post about stuff.